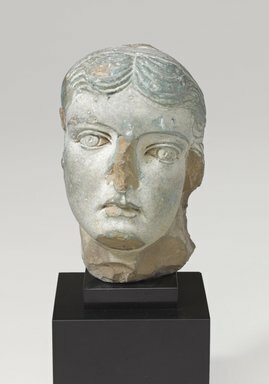 Female head in glassy faience, originally blue-green, now pale green, preserved to base of neck. Head tilted to left, face of a pensive type with open mouth. Hair parted in center and dressed in corkscrew curls falling down over shoulders and on back. Wide flat diadem (?) or band on head. Remains of a square base (? support of an attribute) on top of head. A queen or goddess-possibly Isis. Condition: Glaze worn. Nose chipped. Attribute from top of head lost. Curls chipped as are chin and front of neck. Apparently was part of complete statuette.